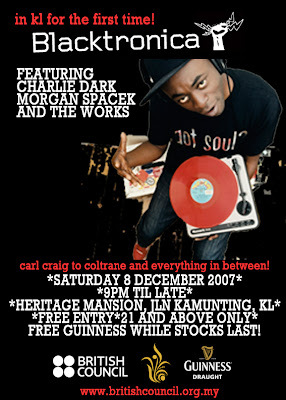 Charlie Dark is the founder of the revolutionary Blacktronica collective and formerly of one third of the critically acclaimed ensemble Attica Blues. He was in the city in conjunction of the Spoken Word showcase happening on the next day. Me and the crew from PW was hyped for this show from the get go, especially when I found out that the prominent Drum n Bass outfit The Works was going to be the opening act for the night. This event was made possible by the lads from British Council. The four of us arrived at the place around 10 pm and made our way to the new club Heritage Mansion after half an hour finding our way to the club. As we make our way to the entrance, me and the guys were halted by the bouncer at the door, and the reason being we were not dressed according to the dresscode. I was pissed at first, cause I didn't drove all the way from Shah Alam just to be denied because of the way we dressed. Something had to be done, I made a call to Shinji (Figure Of Speech) and explained the situation to him. We both talked to the hostess of the club, but she seemed to be strict about the club policy. So Shinji went back in to get Sunitha, the Representative from British Council, but to no avail because the hostess was adamant about the dresscode, but not until Charlie Dark (yes, the headliner himself!) came down and sort this crap out. Me and the guys were finally got in. Personally and on behalf of the PW crew we would like thank you guys Shinji, Sunitha, and Charlie for getting us in. Upon entrance Morgan Zarate aka Morgan Spacek spun a few old school RnB and Hip Hop classics with the likes of A Tribe Called Quest including other classics that did not received regular rotations on the decks or on the airwaves to warm up the crowd as DJ Cliq provided some of his signature scratches in between Morgan's mixes. Morgan's production resume ranges from Common, Mos Def, Amp Fiddler to name a few. Currently he’s completing his debut solo album which will be featuring a diverse set of artists including Dizzee Rascal, Ghostface Killer, Raphael Saadiq, and Eska. About the time the crowd was hyped up, The Works took centerstage and opened the show with 3 outstanding emcees (Figure Of Speech, WordsManifest, and HQA) ripped the mic with their tight rhymes, the crowd was cheering and I can't get enough of the dope beats these maestros churning. DJ Mac provided DeeBee and Jungle beats in full assault with his phenomenal mixing skills (this is the guy who mixed Slayer's "Raining Blood" with Drum n Bass. Believe that!) Cody the conductor of the symphony was twiddling with the sounds and making sure we the audience get the experience of every beatsworth and DJ Cliq were exceptional with his scratches amidst the devastation caused. Me and the crew moshed for a while even Shinji went into the pit. Heritage Mansion wasn't ready for this massive sounds. The works definitely tore The Mansion down. After a 45 minutes set it was time for the headliner Charlie Dark himself to take command as he opened the mic to the crowd for an impromptu jams and spoken word performance letting anybody who would rhyme on a beat. 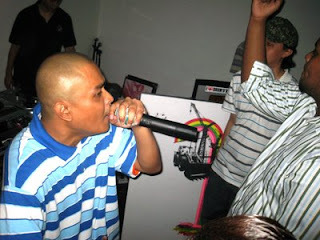 The first to step up was Family Boy, second was Saph one half of NBE and these two were also from Rogue Squadron a Malaysian Underground Hip Hop collective, I was the third and the last one of the open mic emcees. That's me on the mic!! !